Adobo is a staple at home, and we really love my mom's version of adobo: a bit sweet, meaty and saucy adobo. I believe that adobo is the most flexible Filipino dish as it can be cooked in any style yet it will always be recognized as adobo. The Adobo Movement was launched in 2015 to push for Adobo to be our national dish. Each home, each province, and each region has its own adobo. This movement is also supported by partners Philippine Culinary Heritage Movement (PCHM) and the National Historical Commission of the Philippines (NHCP). 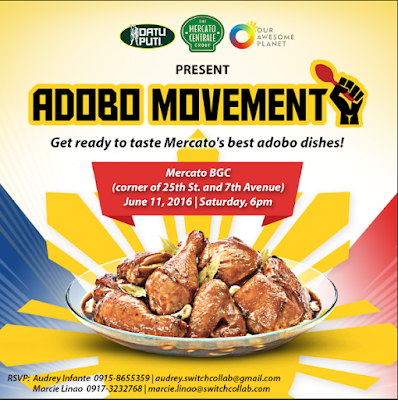 To get people more involved in the Datu Puti Adobo Movement this 2016, the advocacy group mounted the Datu Puti Adobo Challenge and gathered Mercato Centrale’s veteran home-based cooks to create their own special Adobo dish. Participating food vendors of Mercato Centrale prepared adobo dishes using any type of meat and vegetable, and were marinated in or cooked with at least two of the three main Datu Puti products: vinegar, soy sauce, and patis (fish sauce). The top 14 entries were selected based on various criteria, including: creativity of concept, which looks at the story behind the dish as well as originality, branding and cooking technique; innovation, noting the use of unique special ingredients and Datu Puti products; and Philippine culinary heritage, including how it adopts and represents regional cooking styles. Traditional adobo made with chicken breast cuts - healthy and Halal! 100% pure beef adobo patty burger with kiwi and special sauce. A well-known regional twist to the classic adobo, pork cuts cooked in garlic, vinegar and fish sauce. A savory salad of adobo flakes, red egg and ripe mangoes. This one was my favorite as I really love the sweet and salty combination of the salted eggs, ripe mangoes and the adobo flakes. Shredded chicken boiled in coconut milk and cooked adobo style-wrapped in lumpia wrapper and deep-fried. All Adobo winners were awarded start-up funds in cash, so they could include their winning dishes in the regular Mercato menu. The People’s Choice awardee also received P3,000 worth of Datu Puti goods.